The 13th Asia Cup Twenty20 series will start today at Bangladesh with the clash 1st Match between India vs Bangladesh teams, and the match will be held at 7 pm at Shere Bangla National Stadium, Mirpur. It is the first time, the Asia Cup conducts the series as Twenty20, and it was concern about next month Twenty20 world cup. There were five countries in the list of this series: India, Sri Lanka, Pakistan, Bangladesh and UAE. It is doubtable about the presence of MS Dhoni at the pitch because he is suffered from a muscle spasm. So, BCCI needs Parthiv Patel to makes a backup Wicket-Keeper. Recently, he was played well in the local matches and scored centuries in the local tournaments. But Toss happened, and MS Dhoni is playing today. And the overall point of view, the Indian team is looking as good form due to the recent continues victory against with Australia and Sri Lanka. It is the notable point, the Indian team was beaten by Bangladesh at the same pitch last year in 3 match One-Day International series. So, it is little tough to play in front of their home crowd for team India. Also, Indian team players especially batsman will need to perform well and ready to face the left arm medium fast Mustafizur Rahaman. Because of his ball, India lost their matches last year. Taskin Ahmed and Al-Amin Hossain are also ready to give the toughest bowl against to the Indian Bats’. All-rounder Shakib Al Hasan, Experienced Captain Mashrafe Mortaza, Former Captain Mushfiqur Rahim and all are also ready to give the toughest game, at First, Asian Cup 2016. Indias’ top batting order having with Shikhar Dhawan, Rohit Sharma and Virat Kohli. And in the middle, as a general, specialist in the row such as Suresh Raina, Yuvraj Singh and Dhoni. About bowling lines ups: Ashish Nehra, Jasprit Bumrah, Ashwin and Jadeja. A new bowler, Jasprit Bumrah makes the India team as an extra safety at the last minute of the match. Mahendra Singh Dhoni (captain and Wicket keeper), Rohit Sharma, Shikhar Dhawan, Virat Kohli, Suresh Raina, Yuvaj Singh, Ravindra jadeja, Hardik Pandya, Ashish nehra, Ravichandran Ashwin, Jasprit Bumrah, Ajinkya Rahane, Harbhajan Singh, Bhuvaneshwar Kumar, Pawan Negi, Parthiv patel. As early said, Mustafizur Rahaman, Shakib Al Hasan, Mahmudullah Riyadh, Soumya Sarkar, and all are ready to play on their birth ground. Mashrafe Mortaza (captain), Imrul Kayes, Nurul Hasan, Soumya Sarkar, Nasir Hosain, Shabbir Rahaman, Mahmudullah Riyadh, Mushfiqur Rahim (wicket keeper), Shakib Al Hasan, Al-Amin Hossain, Taskin Ahmed, Mustafizur Rahaman, Abu hider, mohammed mithun, Arafat Sunny. 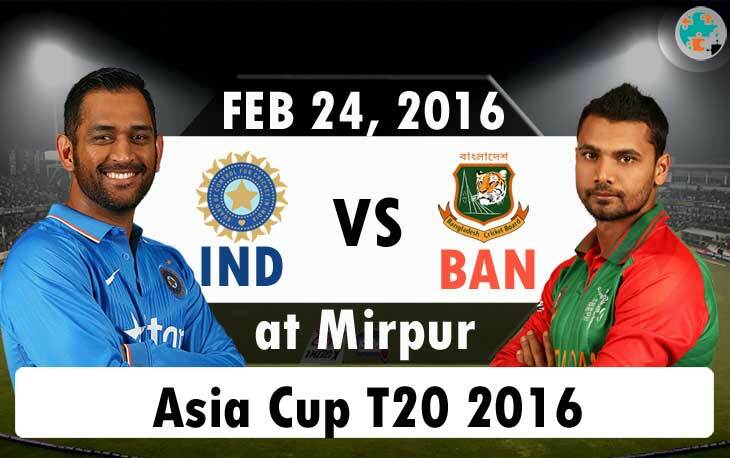 Watch India vs Bangladesh Live Scores available at ESPNcricinfo, Star Sports, Cricbuzz. Just Toss happened, Bangladesh had won the toss and chose to Bowl first. According to the stats, India only loses four wickets in average when they play T20 in Bangladesh. We hope this match is going to be a great start for the Asia Cup as most of the players in both the teams are in Good Form.